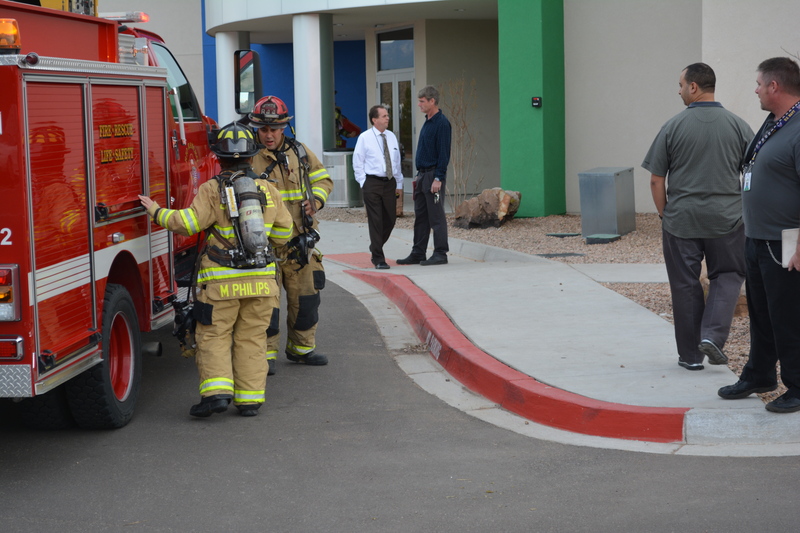 The Rio Rancho Fire Department came to campus as a precautionary measure yesterday during seventh period, after a lithium battery pack exploded in the robotics storage closet. Classes were interrupted by an unexpected fire drill yesterday during seventh period. What was thought to be another routine fire drill turned out to be the actual smoke alarm, which was triggered by smoke billowing out of the robotics storage room. Scholars filed out of the school and waited patiently for the fire department to arrive. “When the alarm went off, the first thing was to get everyone out. I was so proud of the staff and scholars, they exited the building, they met in their areas, they took role, and gave me green cards. The rooms were unlocked in case the fire department needed to get in there, and they kept their kids outside until we could give them the clear signal to come back in, just like we practiced–I was so proud of them,” said Assistant General Manager Daniel Barbour.